Max Coleman was a participant on the East Bay Community’s Birthright Israel trip this summer. He is sharing reflections, stories, and photos of what he experienced on Birthright in Israel for ten days with us. 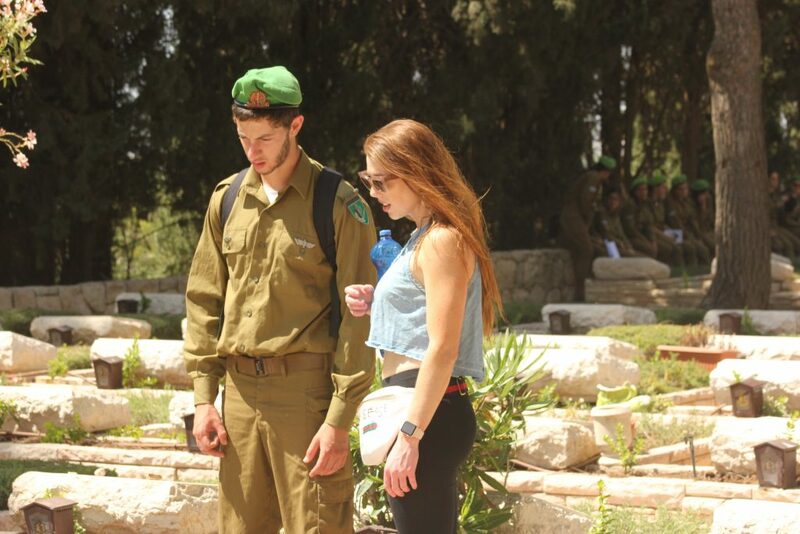 Amit (IDF soldier) and Samantha (Birthright participant) at the graves of fallen Israeli soldiers, approx. ages 19-25. 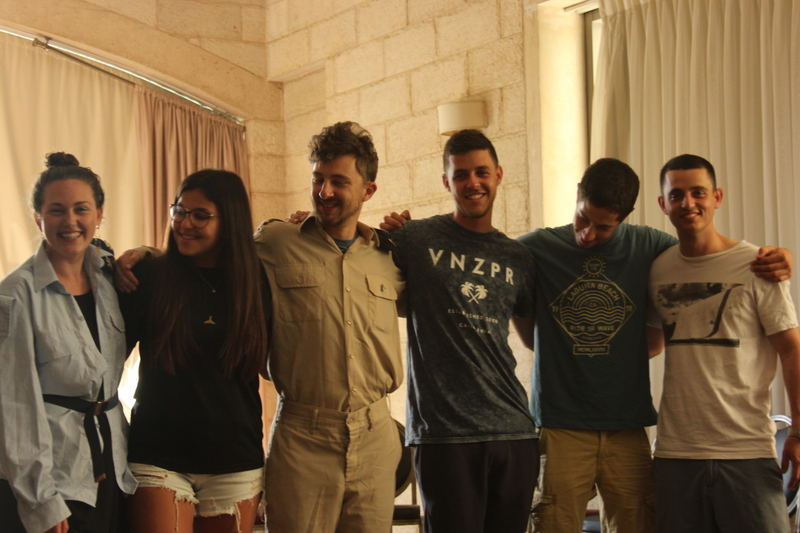 This experience of serving in the IDF gives Israelis a sense of place, and a national identity, that Americans lack. The sociologist Émile Durkheim argued that young people must be given not only a formal education but a “moral education” in which they learn the value of group membership in general, and citizenship in particular. While I do not claim that the IDF is the perfect vessel of moral education—no moral system can escape the sorrows of war unscathed—it seems likely that Israelis develop a keener sense of collective identity than Americans do, as a result of their service. 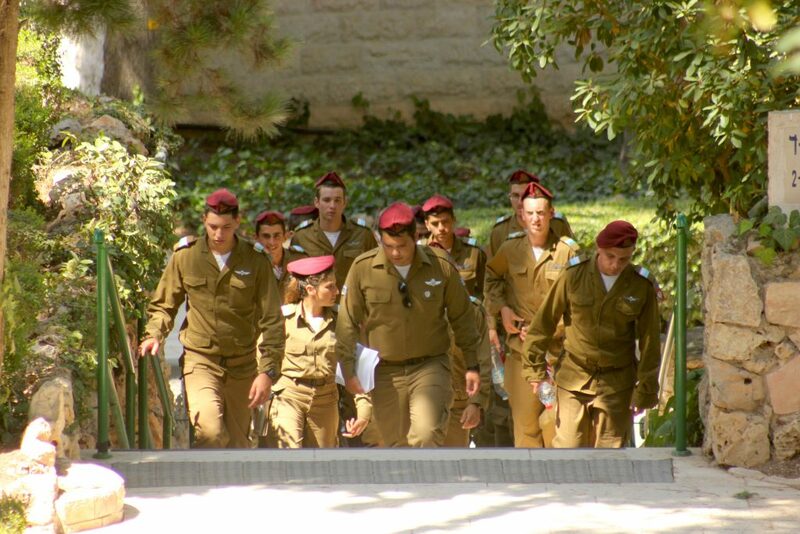 Conscription in the IDF both reflects and facilitates other aspects of Israeli culture. Israelis are often referred to as “sabras,” or prickly pears, suggesting a tough exterior that masks a sweet and fruity center. 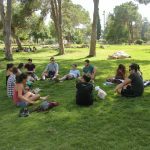 (Whether or not this stereotype is true is hard to say: most of the Israelis on my Birthright trip were sweet and welcoming from the beginning, eager to meet the Americans with whom they’d be spending the next week. So I have a somewhat biased view on the matter.) If sabra is indeed an apt description, it could certainly be the case that the tough mindset required in the IDF translates into other aspects of Israeli life. To be sure, the sense that one is always under threat from hostile forces—a sense no doubt reinforced in the military—may lead Israelis to be understandably hesitant toward strangers. But then, this may be true of Americans as well: social scientists like Robert Putnam have long observed that Americans are less trusting than most other cultures; as with Israel, perhaps, the diversity of the population sometimes leads to a sense of guardedness that more homogeneous nations do not exhibit. IDF soldiers climbing the stairs at Mt. Herzl. Despite their so-called prickly exterior, many Israelis are warm and emphatic at their core (I hesitate to say “most Israelis” given my limited experience and my desire to avoid stereotypes). As one of my friends put it, Israelis are “less considerate but more compassionate” than Americans. I think this is an apt description: while Americans are very interested in appearing warm (the “smiling American” became a much-derided stereotype in Britain as early as the 1800s), Israelis appear more interested in substance. Like many cultures, such as the Russian, they care very little about outward displays of charm, leading some Americans to see them as rude or unapproachable. And indeed, these cultural differences can lead to tension, as many people in our group experienced. In the marketplaces of Jerusalem and Tel Aviv, many of us were taken aback by the aggressive sales tactics of the vendors, and we often got ourselves into trouble by not communicating clearly enough. After one vendor tried to cut me an enormous piece of halvah, only to tell me it would cost 113 shekels (nearly $40), I refused to pay and he angrily shouted, “Why did you let me cut it for you? Now it’s garbage!” Other Americans had food thrown at them when they objected to the amount they were being offered, and still others had vendors fill giant bags full of food only to become incensed when the American customers repeatedly asked for less and less. To be sure, some of these experiences were less about “cultural differences” and more about unpleasant interactions with overzealous vendors—made worse by our inability to speak Hebrew. Still, the somewhat prickly nature of these interactions may be explained, at least in part, by differences between American and Israeli cultural practices. To give just one more example: when a few friends and I tried to find seats at a crowded restaurant, the server told us bluntly, “There’s no room for you here.” There was no trace of apology in her voice; the point was stated plainly and without concession. In America, the interaction would have gone something like this: “I’m so sorry, but it looks like we’re out of tables at the moment. Fridays are really busy for us. If you like I can put your names down and I’ll let you know right away when we have a table for you!” The American impulse—to satisfy the customer no matter what, to smooth over any unpleasantness, to anticipate additional concerns and try to alleviate them—contrasts starkly here with the Israeli desire to tell it like it is, without sugar-coating. Again, while I am hesitant to read too much into these interactions, it seems reasonable to assume that cultural differences explain at least some of these experiences. But despite the similarities, I think it would be disingenuous to claim that Israelis are “just like us.” Such reasoning elides the very real struggles that Israelis face, and also minimizes the cultural, political, and geopolitical differences between the United States and Israel. It is always tempting to compare rather than contrast—to say, we’re all the same in the end! But far better to recognize our differences and reach out across the divide, knowing that the basis of collective flourishing is not consensus but compassion.